Mfg. by FORT & PEGORARO SpA in Italy. 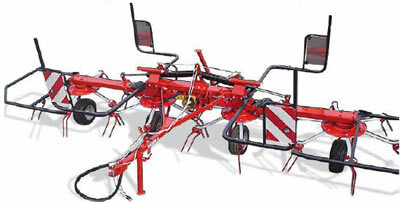 4 Rotor with Hydraulic Lift. Get your hay out of the field faster with Model FHT-540Hay Tedders. Cast iron gear boxes and transmission housings with heavy duty steel tube construction assure years of dependable service even under the most demanding applications. Oversize 15? tires provide excellent flotation and keep your machine moving under the most extreme field conditions. A heavy duty PTO with standard over-running clutch and built in torque protection assure years of safe and trouble free operation. Adjusting your tedder to varying field conditions is a snap away with an easy to adjust single crank handle mechanism. Don�t worry about getting on and off of your tractor to move around the field, The 540 model comes standard with dual hydraulic cylinders for moving your machine into transport position and back to working position. One single acting remote is all you need. Whether you are doing a big job, or a little job, these heavy duty machines are built to do the job right! Get your hay out of the field faster with Farm � Maxx Hay Tedders from Unifarm. Cast iron gear boxes and transmission housings with heavy duty welded steel tube construction assure years of solid performance. Oversize 15? tires provide excellent flotation even in the roughest of field conditions at high operating speeds. A heavy duty pto with standard over-running clutch and built in torque protection assure years of safe and trouble free operation. Adjusting your tedder to varying field conditions is a snap with an easy to adjust single crank handle mechanism. Whether you are doing a big job, or a little job, these heavy duty machines are built to do the job right! Where can these premier Italian made FORT tedders be purchased? After 57 years in business, we know how to serve customers with "service that satisfies. CarverEquipment.com is a marketing dba for Fast Forward Services, Inc., Steve Carver, President. In business since May 1959. Just fill in the blanks on our quote request form and we'll send a firm priced - delivered quotation. These "Farm Maxx - FORT" tedders have earned the reputation of being the very best valued and quality in the world. They have the ultra high standards of quality controls insuring the best workmanship and materials in the market. They are carefully loaded into sealed containers for the overseas shipment. After being unloaded at our distribution center, they are ready to be shipped direct to you. All FORT products we sell are made in Italy.